Caitlin Foster is an artist based in Bushwick whose hand-drawn patterns, textile designs, and illustrations are both expansive and intricate, drawing on both the natural and imaginary worlds. She has done illustrations for Urban Outfitters, REI, and The Verge, and has recently collaborated with the bedding company ZigZagZurich and the Japanese athleisure company Encl, while also continuing to pursue her own more personal artistic explorations. Eliza Harrison, an aspiring art writer who enjoys exploring the intersection of fine and applied arts and who spent the spring working with BRIC's Contemporary Art Team, is a long-time follower of Foster’s vibrant Instagram and sat down with the artist to discuss her practice. 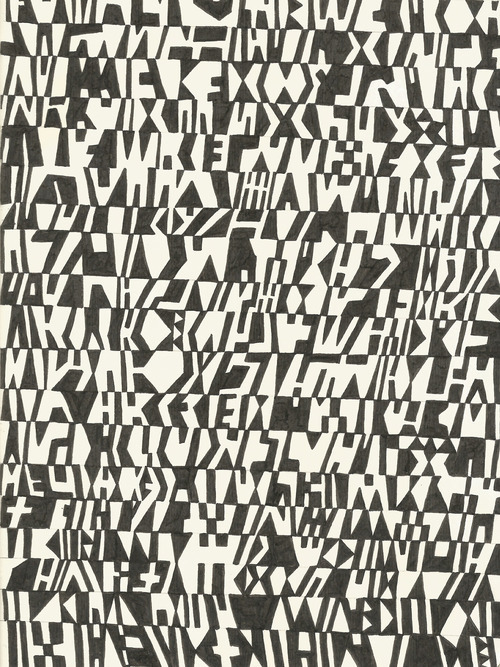 Hanging on the wall during their talk was one of Foster's current projects, titled Garbled: a large black-and-white drawing whose geometric and gridded repetitions oscillate between positive shapes and negative spaces, creating a vibrating, optical hum. 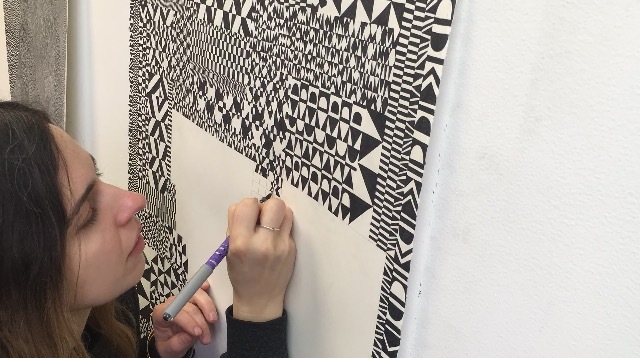 In the unfinished white space that remains, light pencil outlines marked rectangles that Foster would soon fill with more meticulously hand-drawn designs, building a pattern that is simultaneously cohesive and non-uniform. She is currently filming herself as she works on this drawing for ZigZagZurich, who she collaborated with this past fall. Eliza Harrison (EH): This piece (Garbled) feels almost like you want to try to read it. Caitlin Foster (CF): Yeah, some of the shapes almost look like letters of the alphabet. I made a couple of smaller versions first. EH: The detail is unbelievable. I see you have a lot of Micron pens on your desk, are those what you mainly use for your work? CF: Usually, but for this one I’ve actually been using everyday office pens. I made a couple of smaller versions in my sketchbook first. I have all of these sketchbooks and my intent with them was to just make a bunch of crazy, experimental drawings and then figure out what might work for bigger drawings. But the big drawings take me so long to do, and these little drawings also take a long time to do, so I almost think of the sketchbook as a piece in and of itself. And also, since I’ve been doing freelance work, a lot of that stuff I’ll just make in a sketchbook and then digitize the rest of it. EH: Looking at the designs on your website and blog made me wonder how much you rely on digital tools to produce or plan your designs. For example, do you ever make small drawings and then use digital tools to see what they would look like on a larger scale? CF: It’s funny because I’ve been showing this larger grid drawing week by week to my friend who’s a designer and I think it almost drives him crazy. He keeps telling me, ‘I don’t know why you don’t just plan it all out ahead of time and just Photoshop how you want it to look.’ But a lot of the way I like to work anyway is very process-oriented. I’m sort of making little constraints for myself as I go along with it, so it’s totally organic the way that they happen, especially with the bigger ones. EH: That’s really cool, so the patterns surprise you? CF: Totally. I think I also want to enjoy myself as I’m making them. I could see how it might make sense to plan out a detailed part for this section and a larger part for that section, but then when you’re really doing it, it’s not as fun to do. EH: Do you just get into a zone? CF: Yeah, and then I just figure out a rhythm as I’m doing it. The one on the left, that one took a really long time to make because I was making it while I was moving around a lot. Last year I had to move studios twice, and I just didn’t have a lot of dedicated time to work on it. So a month would go by and I wouldn’t work on it and then I’d pick it up again and just totally change how I wanted to do it. I would just do a loose sketch of it and be like, ‘No, I want to do something entirely different.’ The one that I’m working on right now has been really fun for me, partly because ZigZagZurich asked me to send them a couple videos of me drawing, for marketing, and after doing a few I got interested in it and how it affected the way I worked so I’ve kept filming myself. Even though I just started doing it recently, it’s made me work on the piece more–I’ll start working and just finish the entire section because I want to film the whole thing. Usually I’ll take a break, work on something in my sketchbook, go back to it, but when I’m filming myself, I have the attitude that I’m going to hammer it out. And for that one, I will sort of grid it out to decide which section will have a certain style. But beyond that, I’ll do some small planning to make straight lines and all of that, but I’m really just figuring it out as I go along with it. EH: I love that one; it feels almost like you want to try to read it. There’s so much movement and detail in these works­, but at the same time they’re very meditative and calming. Do you find them maddening or meditative to create? What are your strategies for staying focused–or in ‘the zone’–as you work? CF: It’s super meditative. I listen to podcasts. It’s interesting because when I’m drawing, if I listen to music, I can’t focus, so I listen to podcasts or a story or a book on tape and then I can totally get into it. But when I’m doing design work and I’m working with photoshop, I can’t listen to podcasts and I can only listen to music. It’s like a split in my brain. EH: What podcasts have you been listening to? CF: I just listened to all of S-Town last weekend. CF: These ones here were from a show I did in L.A. with my friend Kiki Johnson. The show was sort of about how I made insane, super-detailed tiny drawings that take forever to make, and my friend was then making smaller, quick paintings that she would complete in an evening. Seeing them together was cool–I just had these two drawings in it and I was like, ‘That’s it!’ When you see these, this is the work I do and I really just do it for myself. I rarely show my work that much. But I feel like when you see it, it makes sense doing the other work that I do, like textile design, because they’re super patterned and that’s just what I’m doing all the time anyway. EH: As you’ve moved more into design, do you feel like your practice or process has changed to accommodate that? Or are you using the same processes and art towards a different end? CF: I do feel like a lot of my sketchbook drawing is now catering more to “look, I can draw works in this kind of design context.” For sure, I’m gearing towards that. But I think of my larger drawings as definitely related to that, even though it’s just totally for myself. 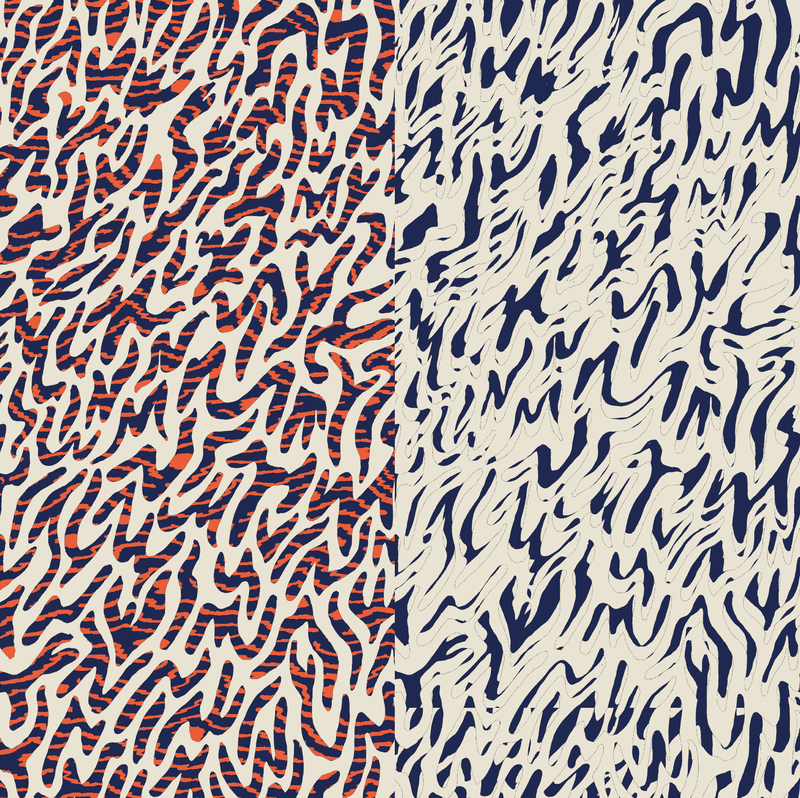 EH: Did you find this style of pattern design at art school, or did you discover it on your own time? CF: When I was in art school, I was really interested in portraiture. If you look at the portrait sketches on my website, most of those are very old. I was super interested in just drawing people and more representational stuff. But there would always be a really detailed, pattern-heavy part of the drawings. Also, I made wallpaper when I was in art school, and then I would put drawings and paintings on top of it. Then after art school, I kind of felt like “I don’t think I can be an artist, I don’t think I’m good,” and I was more interested in working in a gallery or being a curator or something else in the art world. I didn’t really make anything for a couple years, and then when I started again, I was like, “I’m just not going to try to do any figurative work and I’m just going to draw the backgrounds of what my drawings are like.” So I tried to make a concerted effort with that. Now I can’t draw people! If I try, it’s really hard, or they just look exactly the same–it hasn’t evolved, you know? I draw every day, but if I draw a person, it looks like how I would draw if I were eighteen still. EH: Keeping with this shift, have you been looking for new or different sources of inspiration since you’ve been working more into design? CF: I think I realized a little bit before I started doing more design work that what really interests me is pattern. With fashion, I’m not really interested in the design of a dress, but rather the act of wearing something that has a crazy pattern or color on it. That act is more interesting to me than looking at a painting. After a while, I realized that that’s what I look at in my own time, that I was really interested in textile designers and the Memphis group and the history of design and that kind of work more so than fine art. I’m still totally inspired by a lot of artists, but I just felt like my focus and what I found myself researching was more design-heavy stuff. Of course I will always feel drawn to looking to the art world for inspiration, but the everyday application of design is more exciting to me right now. EH: I totally agree, I wrote my thesis on Sonia Delaunay. I just think it’s so cool to see a two-dimensional design become three-dimensional. CF: Somebody like her, too, where she’s straddling fine art and design, and making things that you can wear or that exist in your house–and it’s not this precious object. That’s more exciting to me. I think also, honestly, working in the art world made me more sour towards fine art, and seeing how these things that were always presented as lofty ideas–or this idea that art is this sacred thing–and then seeing the commercial side of it really grossed me out. With design, which is a world I’m not as familiar with, it feels more like “it is what it is” and it can be something higher but it’s not always putting itself out as that, and you see the materialistic side of it and it can be gross too, but it’s not as sad I guess. It has a different life, I think. I don’t know, it so happened that I started getting asked to do more design freelance work alongside when I was working at a gallery and feeling like I hated it and that it wasn’t really what I wanted to do. These two things happened at the same time and one fed into the other, so the shift happened naturally, too, but I can see where I was a little revolted. Now I feel a little bit in between the two worlds. EH: I feel like that fits with the art historical context of a lot of women making art and design. Are there other artists, either historical or contemporary that you find yourself looking towards? CF: I like Nathalie du Pasquier a lot. She worked with ZigZag–that’s how I first found out about them, she did a line with one of the other Memphis people called CoopDPS. I like her whole history, and I think what she’s making now is really cool. Making objects, making clothes, making paintings. I like Tauba Auerbach’s work a lot, too, she’s also interested in design and talks a lot about that. Anni Albers is great. The gallery that I work out now sells some Josef Albers prints, so I’m looking at his work a lot, and I like his work too, but her work is so good. EH: This is kind of tangential, but what’s that lumpy thing on top of your flat files? CF: This is a bag of rocks that I got from this archeological dig in Italy because they used a drawing of mine for a workshop that they did. They just sent me this in the mail as a thank you! EH: That’s so cool! A lot of your work evokes natural elements. When you’re stuck in New York, where do you go for your nature fix? CF: We have a lot of plants in our apartment, and I like the botanical gardens, the Bronx one and the Brooklyn Botanical gardens. I like going to the Metropolitan Museum, too, and seeing all of their artifacts and natural history collections. I always find a lot of stuff to draw there. EH: On a more basic level, what are your biggest challenges right now as an artist? And it can be practical, or theoretical, or otherwise. CF: I guess finding a way to be an artist. Period. In the city. Both in just trying to support myself with freelance commercial work and finding outside interest in the personal work I make. I don’t pressure myself to try to show my personal work, I’m more pressuring myself to do more paid freelance design jobs. But that’s also a part of it–just trying to figure out how to function as an artist and have it make sense to set aside a budget for a studio and trying to make it work. It’s hard to find a cheap space around East Williamsburg/ Bushwick. That sometimes I find difficult. Making it make sense to be able to just be an artist and have what you need and all that so you’re not working a million hours a week. And for the last couple years, it’s made sense for me to have the studio. EH: One other question I had a while back–because these pieces take so long to make, do you have ideas faster than you can draw them? How do you make sure you don’t forget them? CF: Glass frogs. They are so cool. View Caitlin Foster's BRIC REGISTRY PAGE, WEBSITE and INSTAGRAM. Interview compiled by Eliza Harrison.